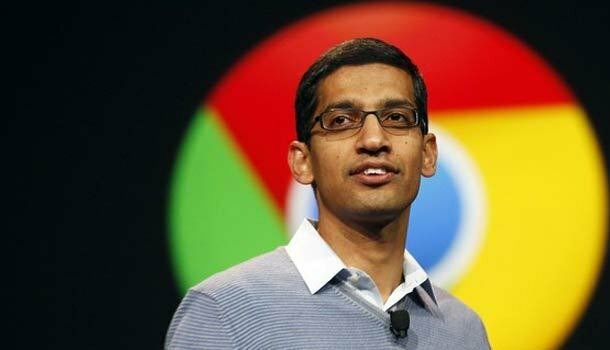 Yesterday, all the news channels, social media platforms, and tabloids worldwide were splashed with the news of Google announcing India-born and bred Sundar Pichai as its new CEO. It’s the second year in a row that an Indian has been handed over the reins of one of the most powerful companies of the world after Satya Nadella was made the CEO of Microsoft last year. Nothing can be more inspiring and motivating than the fact that these guys who rose from the modest soils of the Indian middle class are today poised to rule and impact the entire world. 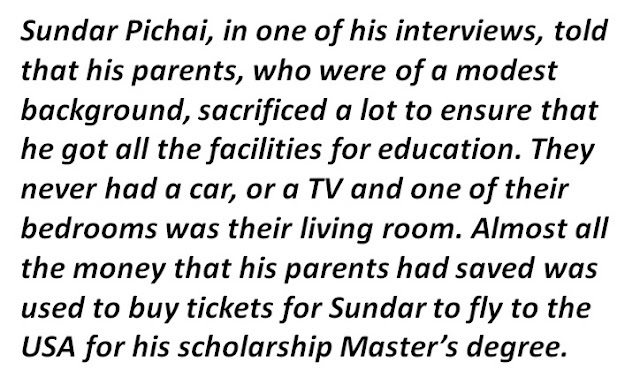 While I was reading about Sundar’s achievements today, an unfortunate thought had dawned upon me - that he would have never got this big an opportunity had he stayed in India. So, I subconsciously began to admire America for being such a great country in supporting entrepreneurialism without which perhaps there would not have been the Google as we know today and there would not have been a Sundar Pichai to inspire millions. And just about then, a sentence that popped out from my father (who was sitting beside me and listening to my raving of Sundar’s life) exposed something that, in this hour of rejoice, may have been entirely forgotten. It’s something that is slowly but surely fizzling out of this world. It’s something without which there would not have been a Nadella or a Pichai, to ours and Google’s or Microsoft’s disadvantage. It’s the generation that we grew up holding hands of. It’s our parents. When I was raving about the above to my wife, my father chipped in and said “It’s really great; his parents’ hard work and sacrifice has paid off well"
When guys like Sundar, Satya and my own generation were growing up it was the period of pre-economic liberalization - when India was considered as a Third world country. The middle class used to struggle to meet ends. Going to a restaurant for that generation used to be a luxury – a once in a blue moon affair. Telephones and cars used to be a few owners’ pride and a whole bunch of neighbours’ envy. And foreign vacations? Phew! Those perhaps used to be the dreams of many from that generation but sadly for a lot of them it never turned into a reality. No. Not because that generation could not have afforded all of these. They surely could have saved and used the money to realize some of their dreams and desires. But then they made a choice. They sacrificed! And made us their dreams!And our education their desire! That entire generation had put their blood, soul and money into just one thing - our education; at the expense of their own personal desires; often passing away without ever seeing their own personal dreams come true. It was this sacrifice that has made you and me, and from amongst us has emerged the Nooyis (Pepsi CEO Indra Nooyi), the Pichais and the Nadellas. Our parents’ generation created a double ripple effect of sacrifice and education. Almost no one was spared from that storm. No one family had the guts to make such sacrifice on their own. It was a uniform and team act. Everyone one was into it together and influenced each other to do so. The entire country was gripped by that fervour. And for this reason, Sundar Pichai (or for that matter Satya Nadella, Indra Nooyi, Adobe CEO Shantanu Narayen), does not just owe his success to his IIT engineering degree, or Stanford University or Google. He owes it to that entire generation, including his parents, that created the culture of extreme personal sacrifice in favour of educating us. I owe it to that generation. You owe it to that generation. And today, Google owes it to that generation. In the light of Sundar Pichai's success, this is a tribute to his parents and all our parents for whatever little we have achieved or goodness we have done in our lives till now. If you like it then please click the Like button, or Share it or put a comment in the comment box.